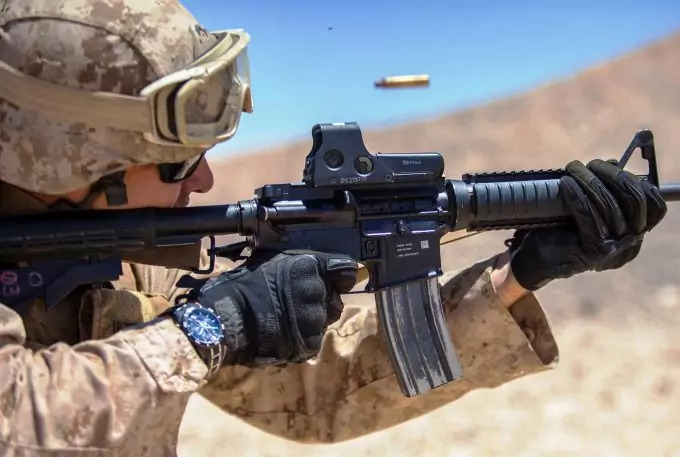 The AR15 is well known for being one of the best sporting rifles out there, similar to an M16 or an M4, it is a semi-automatic rifle with great shootability and commonly used by the US Military. However, when you are using one, either at shooting ranges or for other recreational reasons, you also need a key feature: a red dot sight. And you want it to be the best red dot sight for AR15 rifles. 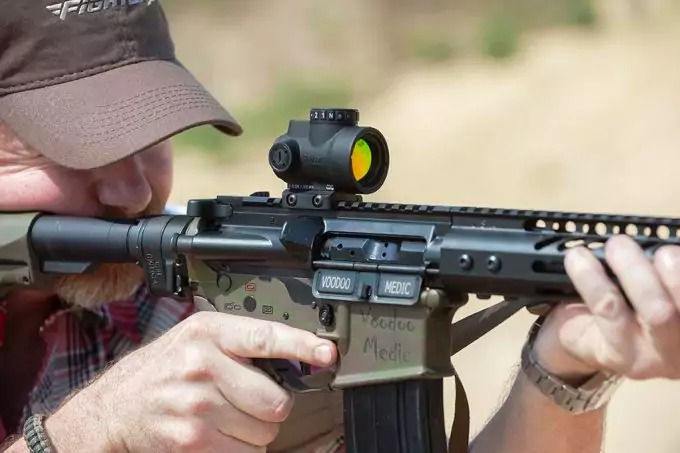 Fortunately, there are many excellent red dot sights for AR15’s, the key is knowing which features to look for in such sights, and understanding which one will fit better your purposes as well as your rifle. They all have one goal, helping you locate your target better, resulting in you improving your shooting, but they aren’t all the same. That’s how we want to help you. We came up with an article that takes a close look at the most important features of the best red dot sights for AR15, and then, takes a close look at the best sights available. We will analyze the sights, give you a good description and good pros and cons, and hopefully by the end of this article you will know which one you should buy. 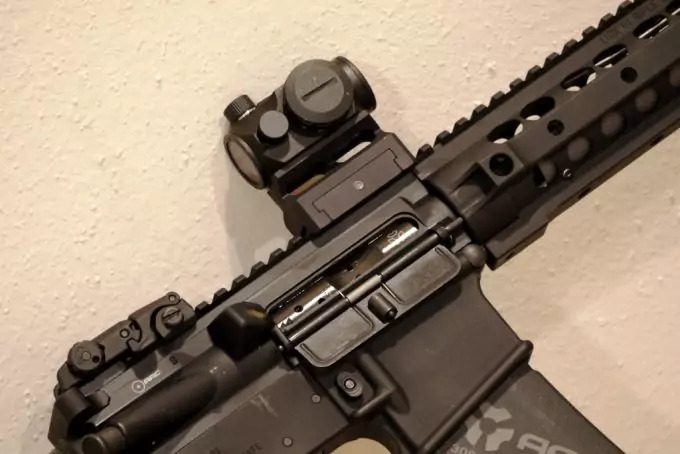 Before buying a red dot sight for your AR15, there are a few features you must consider, starting by the mounting of your gun rail, is it a traditional Weaver or Picatinny? From there you need to consider a number of other features, but we will help you by giving you a brief analysis of the most relevant ones. As said above, this is probably the first feature you want to look into. Depending on which model of AR15 you have, you should look for the rail that it has. 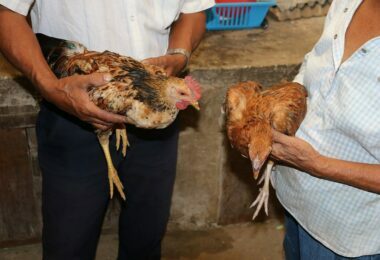 The two most common ones are Weaver and Picatinny. If you have one of those two, then most of the red dot sights will fit perfectly. However, there are still some models that fit just one or the other, although it is rare. The way to solve it is by also buying an additional mount in order to fit your rail. Do not leave this feature unattended because it is a key one. Your gun will probably already have a considerable weight, especially if you have a semi-automatic rifle such as the AR15. That’s why you don’t want to buy the heaviest of red dot sights. 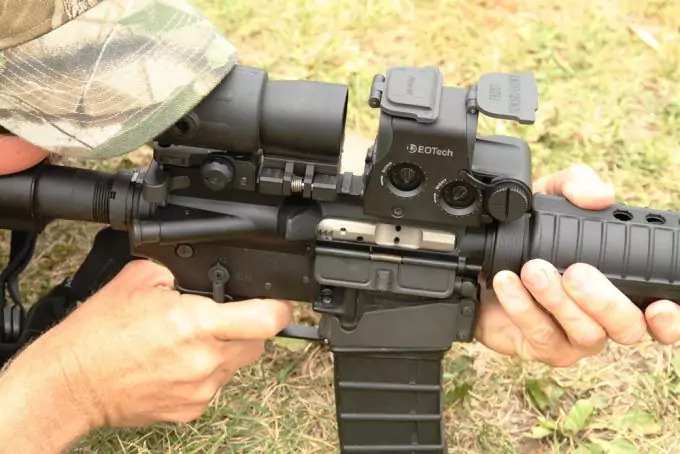 It will be always impossible to buy one that doesn’t add some weight, but if you pretend to be shooting a considerable amount of rounds, and maybe even moving around with your AR15, then make sure you buy a red dot sight that’s not too heavy. The reticle is the dot, which is commonly red, which the sight gives out. However, it is not always a dot, it can have different patterns, such as the shape of a bulls-eye, a more scattered sort of a star pattern, etc. 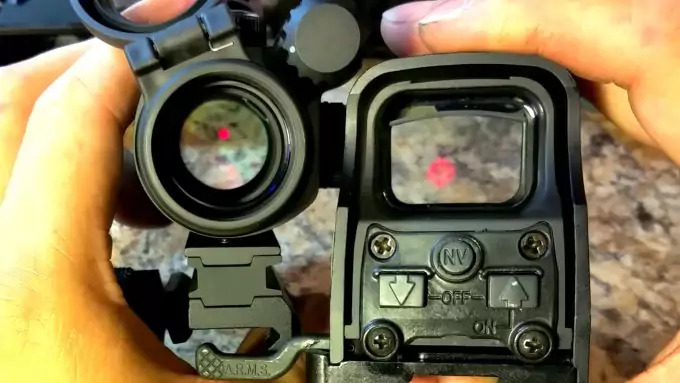 Many red dot sights advertise themselves as having more than one reticle; this means you can pick one. If it comes with four reticles, it is normally a regular dot, bulls-eye and other two, and you can adjust the sight to choose the one you want. Battery life is a very important issue. Most red dot sights, have now a very good battery life, especially those for R15’s, since they are a better sight. However, it should still be a very relevant feature to consider, as you don’t want your sight to stop working in the middle of shooting some rounds. 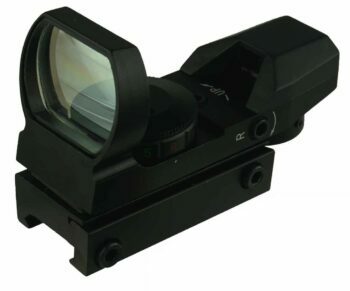 Take into considerations that reflex sights use LED, in order to create the red dot, this means they use less battery life than holographic sights. Also, there are some models that come with auto-shutdown features, which save a lot of battery life. You will see this feature in the table above. The MOA of a sight is an important feature to consider too. The Minutes of Angle are a measurement that spread 1” per 100 yards. Knowing the MOA basically helps you know how precise the sight is. The bigger MOA can mean it is more precise for longer distances, but if you are not shooting over 100 yards, the MOA isn’t that important. If you plan to shoot very long distances, then yes, it becomes important to have a larger MOA. It’s time to take a closer look at each of the models of red dot sights for AR15 that we came up with. We are going to analyze them so that you can closely understand their differences. Hopefully, by the end of the article you will know which one to choose and make the right purchase. 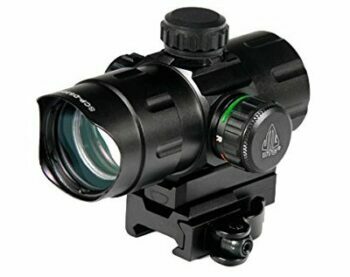 The C-More Systems Railway Red Dot Sight is a very good sight. It comes with an adjustable intensity of the red dot, to make it brighter depending on the light of the moment, whether is darker or if there is more light. It also offers an infinite adjustment for the windage and the elevation, thanks to positive locking screws. This particular sight is built for speed, to allow you locate the target quickly and take that shot as soon as possible. It has a head up display design, which means the sight is a bit further up than usual, and this will allow you to have a much better field of vision, no obstruction from the barrel, hence resulting in quicker and better shots. It has a 6 MOA which can come in handy if you’re going to be shooting for longer distances. Also, it mounts easily on both the Picatinny and Weaver rails. Related: The Decibullz Hearing Protectors are an item that you will want to buy whenever you buy this sight or any other item related to your AR15. Wear them to protect your ears from the noise whenever you go shooting. The Dagger Defense DDHB Red Dot Sight is a more basic sight than some of the others in this list. However, it is still a very good sight for a very affordable price. It comes with both a red and a green dot to give you a choice, as well as a 33 mm aperture, which is quite good. It only mounts a Picatinny rail, so keep that in mind if you use a Weaver rail, you will need to buy another mount for this sight. It also includes four different reticles, meaning there are four different patterns of red dots that you can choose from. It is one of the lightest of red dot sights in this list, so it won’t add much weight to your AR15. Finally, the only upside is that they don’t stay in place very well. 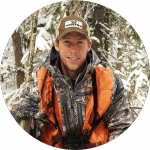 Many users have complained that they don’t even adjust far enough in elevation, and won’t hold place in the windage, even if the recoil isn’t strong enough, it gives up, which is something to keep in mind. Related: The CVLIFE Tactical Rifle Tripod might come in handy if you are looking to use tripods while shooting some rounds. This Holosun HS403A Red Dot Sight is by far the one with the most battery life out of them all. Although it is advertised to hold up to 50,000 hours of battery life, which is a lot, it gives out a bit earlier, but it still is the sight lasting the longest. It also comes with an excellent auto-shut off feature to save the battery life whenever you are not using it. 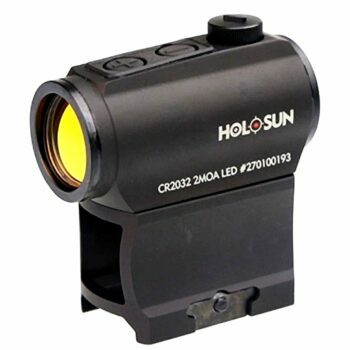 It comes with twelve brightness settings too, meaning that no matter if used during the day or night, this red dot sight will be working, and as written by many reviewers, this is a very high quality sight. It also comes with parallax free unlimited eye relief, making it great for visibility. Another really good and handy feature is how small and lightweight this sight is. It won’t be noticed in the weight of the rifle, and to mount it is really easy, again not taking much space. This is one of the best-reviewed features by users. Related: The Magpul Backup Sights are commonly bought alongside red dot sights. 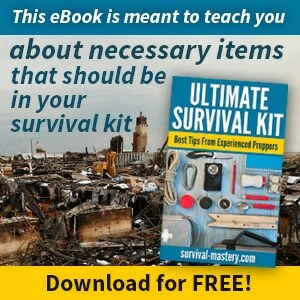 They provide a backup sight that pops up with a quick click in case you might need one. 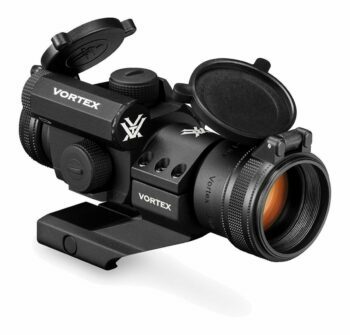 The Vortex Optics Strikeforce 2 Red/Green Dot Sight is a solid sight that will fit really well your AR15. This is a sight with a very good impact and recoil resistance, that unlike other cheaper models, will stay sturdy and in place. It comes with 6,000 hours of battery life, meaning it will last for very long and you don’t have to worry about it. Plus, it comes with two dots, green and red for your choice. 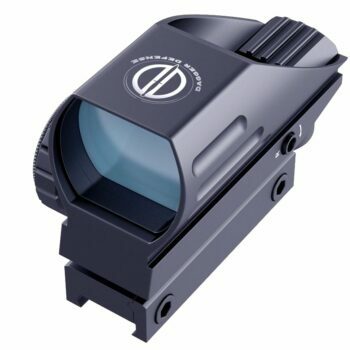 It was built for quick shots, hence why it comes to the eye-relief that allows you to have both eyes open to quickly detect the dot and shoot fast. It also has ten dot intensity levels for different light settings, from the darkest scenarios to bright light scenarios, the dot will be easy to detect. Two of the settings are even night vision compatible. The only drawback is that it doesn’t include any magnifications, which is not exactly a problem, but it doesn’t offer the widest field of view. Related: The Vortex Flip Cap Optics is a great match with this sight. 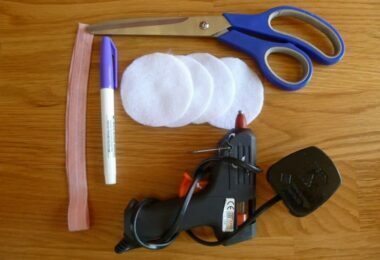 It will protect the lens of the sight when not in use, from dust or from taking hits whilst being carried around. 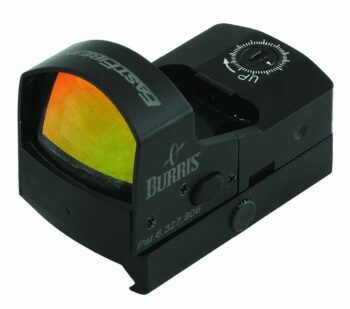 The Burris Fastfire III Red Dot Sight is an excellent red dot sight that will have great results on any AR15. It might not be the cheapest option, but it’s certainly a reliable and durable one. It is made with very high quality materials; hence its durability and reliability. The 3 MOA dot reticle is excellent according to reviewers. Also, it has the great feature of having tool-less windage and elevation adjustments. Whilst other sights are criticized for having screws that are hard to handle, this particular one doesn’t even need a tool, all done with easy hand movements. It also comes with a removable mount in case you prefer another mount. The only drawback is the battery life. This sight has a single switch-operating feature, meaning you have to click it constantly to adjust the settings and that results in a big battery life waste. 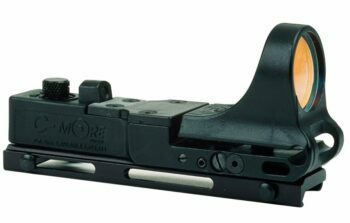 Related: The Burris Fastfire Picatinny Mount is a must if you wish to use this red dot sight with a Picatinny rail. The Field Sport Reflex Red and Green Sight comes, as named, with both a red and a green dot for the user’s choice. It also includes four reticles, meaning you can choose from four different patterns of dots for your preference. It comes with a built in Picatinny mount base, but if you use a Weaver, you will need to purchase a separate mount. It is very lightweight and compact, ideal for those who don’t like to deal with the additional weight. And it is also waterproof and shock proof. It only comes with a dual brightness control, that despite being a good one, it is fairly basic compared to other red dot sights with more adjustments. This is reflected in the price, which is very affordable, but it has this limitation. However, if you are not one to be doing the shooting in many different light settings, this can be ideal for you. Related: The TacStar Tactical Railmount is usually bought together with this sight. It raises the sight, it fits Picatinny rails, and it has side saddle for six extra shells. 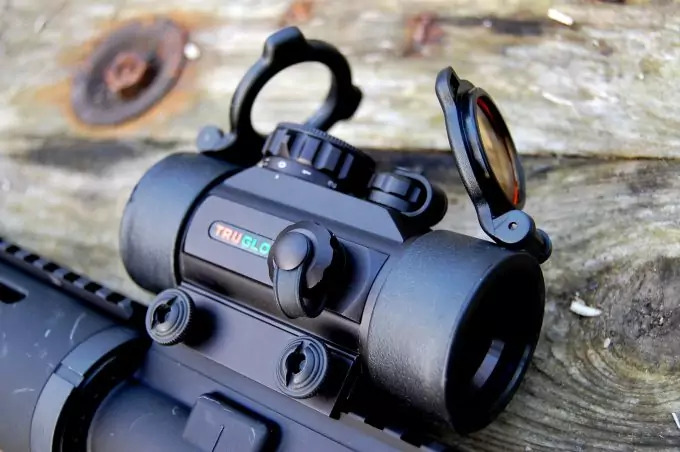 The UTG ITA CQB Red/Green Dot Sight for AR15 has a very good field of view with an unlimited eye relief, allowing you to take very quick shots as well as having both eyes always on the target. The 4 MOA is not only clear, but impressively sharp for a sight that is cheaper than most. 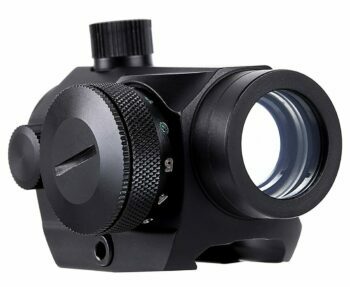 The no-reflection coatings make it even easier to use the sight, making it clear and reliable. The red and green dots will also adapt to the user’s choice as well as the environment. It also comes with variable brightness levels, to fit different light settings. Also, the red dot manages to stay zeroed, even after quite a few shooting rounds, which is good for a budget sight. It is still a budget red dot sight, but good enough for beginners. One of the few drawbacks is the rubber seal isn’t very good and some reviewers have found trouble with it. Related: The UTG Mount Riser is ideal for this UTG sight in case you want to raise the sight further up. Fits both Picatinny and Weaver rails. The Onuhu Riflescope Red Dot Sight is a good budget red dot sight for AR15s. Despite being the cheapest of all the sights in the list, it still has very good features and it’s ideal for beginners who don’t want to spend too much without knowing what to expect. It comes with a quick aim electronic dot sight that allows you to have both eyes open and focused on the dot for faster shots. Also, despite being an electronic red dot sight, the battery life is about 2,000 hours, which is still quite good. It includes 10 brightness settings, a lot to adjust from the darkest to the brightest scenarios and still be able to spot the dot. One of the best features is how sturdy it is. It fits both Weaver and Picatinny rails, and it is sturdy on both of them. Many reviewers praised how they fired many rounds, but the sight remained sturdy, on the right position and still zeroed. A surprise due to the price. It is time to wrap it up, but first let’s take a look at some of the things you might have learnt. 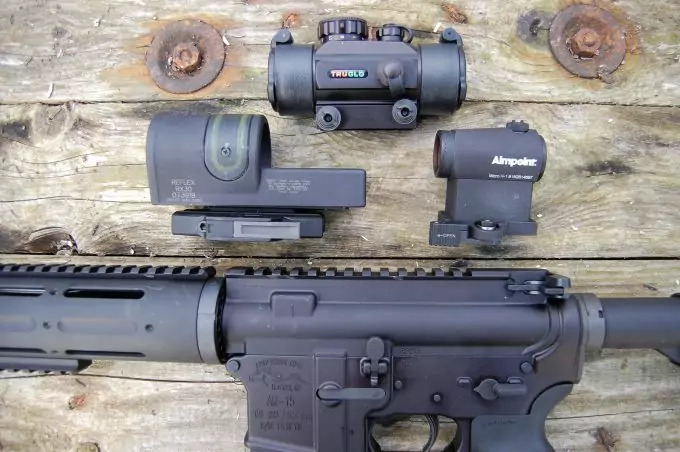 The best red dot sight for an AR15 depends a bit on you, we came up with a list of excellent models, but the features of each one will let you know exactly what you are looking for and what you might consider the best. Sometimes it depends on your rifle, other times on where you go shooting rounds. Remember that settings such as the levels of brightness, or even the reticles, are key factors that can make or break a sight if you are a person that prefers shooting in darker or brighter settings. Also, considering the weight can be important if you like shooting for a long time. Do you think we left out any particular model? What is the feature that you prefer the most? Please share with us your questions and opinions on the comment section below so we can get back at you. And we hope that you are now ready to purchase the best red dot sight for your AR15. 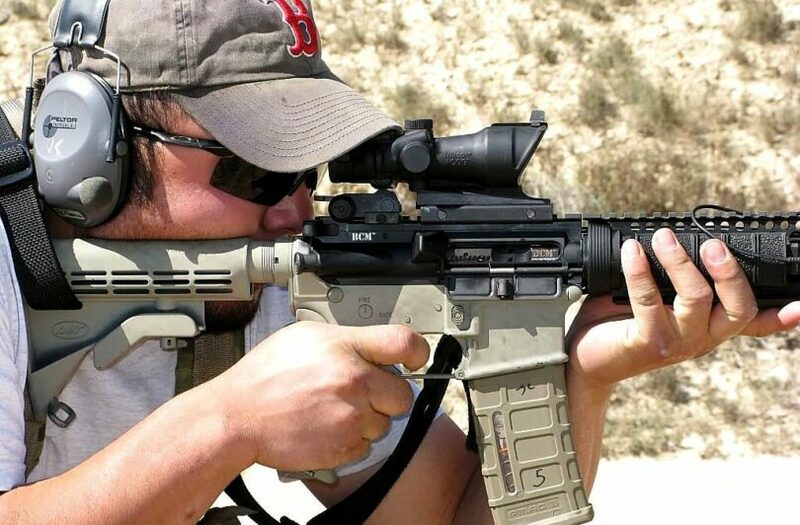 Best 1-4 Rifle Scopes: Upgrade Your Shooting Gear! 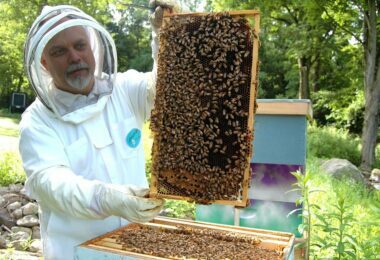 Beekeeping for Beginners: What’s All the Buzz About?